This is a quilt I finished almost two months ago! it was pretty big, and she hoped for a custom look without paying full custom prices, as well as one large feather over the borders. Once I found a path for a single start and stop, I was able to work back and forth, making it easier for me and less costly for her. She also asked that I keep out of the centers of the stars, because she had added a red embroidered accent. Thank you so much for this tutorial on how to quilt a Hunter’s Star quilt. I have a queen sized quilt waiting for me to feel confident enough to tackle it. I will have to practice drawing your wonderful central feather design on paper first. Your quilting plan and video are much appreciated! I am so glad! Let me know how it turns out! 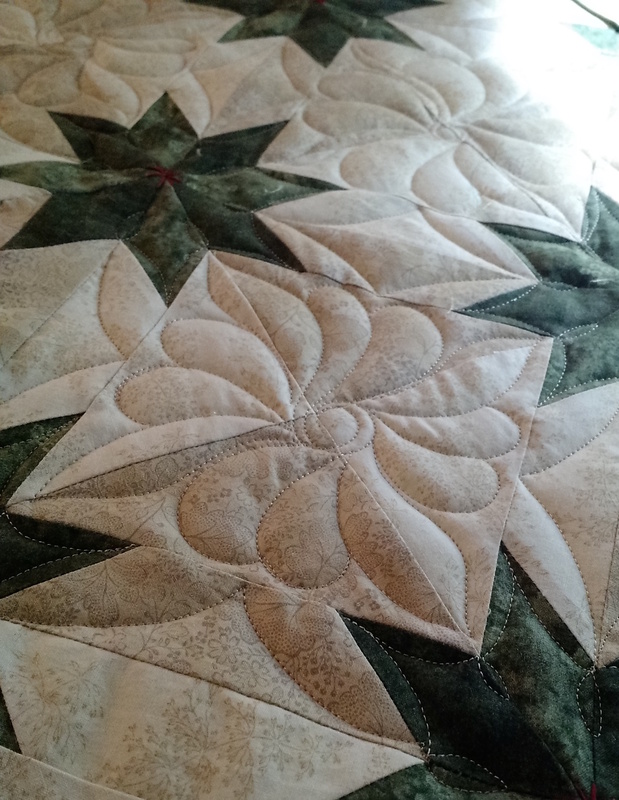 Thanks for your tutorial on quilting the hunter star. I have been stump on how to quilt it. I was going to meander it to get it done. But I was told not to for the hunter star. It is a elegant quilt block. So, I went to search the web and stumble up on your tutorial. I love it. I will need to practice on paper. Where can I get a hunter star on paper like the one you used? I am so glad! I looked up “hunter star block” using Google, then clicked on the tab that said “images” and all sorts of blocks popped up. If that doesn’t work, let me know. Thanks for this wonderful tutorial I have had this top for a year not knowing how to quilt it – I will be quilting this on my domestic machine will let you know how it turns out. Thank again Chris.